What does each OS offer? When you look at the smartphone market today compared to just a few years ago, you'd be surprised at just how different it is. Today's smartphones are slowly taking on more features of PCs than phones – and none more so than the recent release of Windows Phone 8. You could put this down to hardware, with high end phones such as the Samsung Galaxy S3 or HTC One X both powered by quad core processors, but the software is also continually evolving to support it. iOS 6, Android 4.1 and now Windows Phone 8 are moving more quickly than ever, constantly trying to out-do the others to gain more customers, but also to stay at the forefront of an ever-changing market. 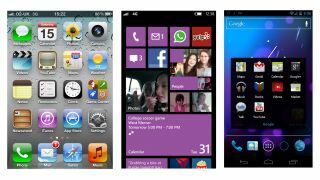 Windows Phone 8 builds upon the easy to recognise system of "Live Tiles". To those unfamiliar, these are squares placed on the home screen that represent different apps, such as a music player or for messaging, that are interactive. Whilst remaining fundamentally the same, updates from the Windows Phone 7 interface now bring more customisable tiles, to allow you to squeeze even more onto your screen. Another major update sees the company bringing in data management via DataSmart, which perfect for those on limited contracts. Android 4.1 takes the customisable homescreens to the next level. Widgets have been always been the heart of the Android OS, and Jelly Bean makes these easier to move, with homescreens adapting to accommodate the placement and resizing of your widgets. These are also easily removed with a quick swipe upwards in edit mode. Apple uses a tried and trusted formula, based upon simplicity. No widgets, no tiles, just a grid of app icons that you scroll through from the home page. Each iteration has added greater functionality, with iOS 6 strengthening Siri and even locking children out of certain areas. Android 4.1 somewhat unsurprisingly, bases its mapping system on the well known Google Maps, bringing Street View, 3D and indoor mapping. Integrating with Google Now, the mapping system continues the sat-nav experience for both pedestrians and motorists, providing details of how and when to leave to get to your appointments on time. Windows Phone 8 surprisingly ditches Microsoft's proprietary Bing Maps. On the other hand, its new system is hardly shocking. Windows Phone 8 now brings in the Nokia mapping system, bringing 3D street navigation, and Nokia's Navteq Traffic Service. iOS has traditionally also based their mapping on Google's offering. This all changes with iOS 6, with Apple's new proprietary system providing turn by turn navigation, integration with Yelp for business listings, and Siri for voice control. Like the others, there are also 3D maps, a traffic service and a satellite view. Traffic data is prevalent through all three, although Apple has taken this one step further by allowing anonymised croud-sourced data at the sites of traffic congestion to help you understand what's going on. Microsoft hasn't skimped on Windows Phone 8's Camera app, getting a new simple, clean look, with a small menu button that accesses the camera's various settings. Nokia branded handsets are also set to bring over the PureView technology that was made famous in the Nokia 808 PureView. Android 4.1's camera system brings in more changes. It's faster than ever, and has a fast review system making editing and removing images simpler. There are also varying scene modes, customisable levels white balance and exposure, all helping you to create your ideal shot. A panoramic mode and photo editing are also thrown in, alongside the impressive zero shutter lag. iOS 6 builds upon the work from iOS 5, debuted on the iPhone 4S. Continuing the simplicity theme, settings are all sorted automatically, including whether the flash is used or not. Focus is also automatic, unless you specify a certain area by touching the screen. For those who require a physical shutter button, iOS also allows the use of the up volume button as well as the on screen option.